Making Vintage Christmas Corsages This Summer! CHRISTMAS IN JULY is only six weeks away! 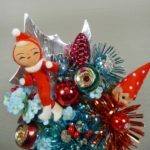 Yes – I know it seems a little weird to have Christmas trims scattered out all over my dining room table on Memorial Day weekend – but I want to make sure I have plenty of wonderful stuff to list before July. I am looking for some interesting combinations to put together – in addition to popular past creations. What do you think of this retro aqua and red look? 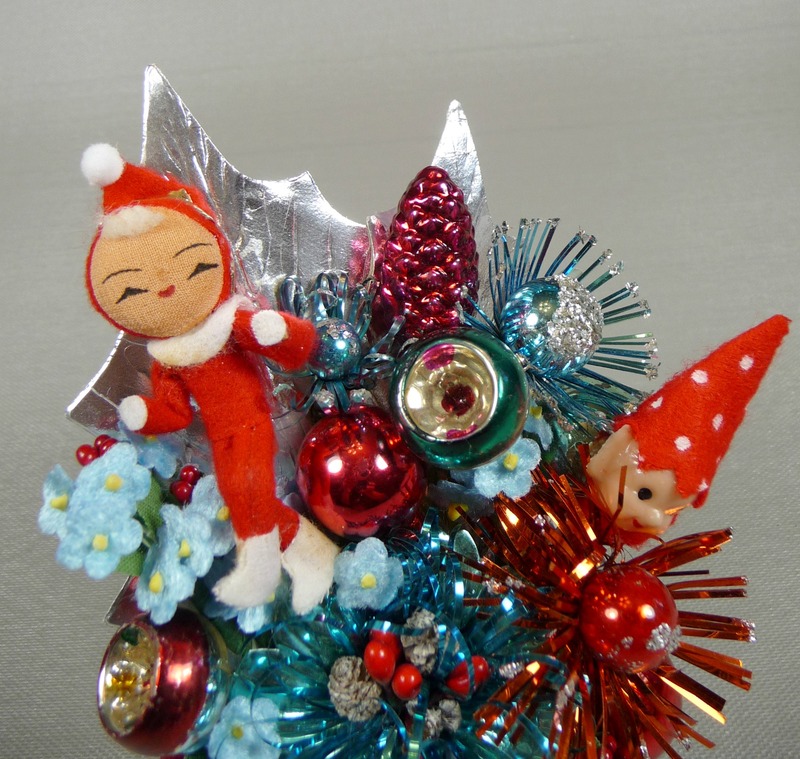 The elves are so sweet – don’t you remember hanging stuff like that on your tree years ago? I also mixed in a lot of variety of mercury glass bulbs in this one… indents, tinsel flowers, mercury glass pine cones… It’s a real sparkler! Do you have a favorite color combination for a vintage Christmas look? Of course, red and green continue to be the MOST popular color combination for a retro Christmas, but anther popular color is pink. I get more requests for custom Christmas orders for pink corsages than any other color combo. 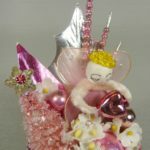 Fortunately, pink was a very popular color for the holidays in the 1950s, and there are lots of pink Christmas-themed ornaments and party favors that are suitable for use in corsages. Here is a pretty angel with a spun cotton head and pink tulle wings and gown. 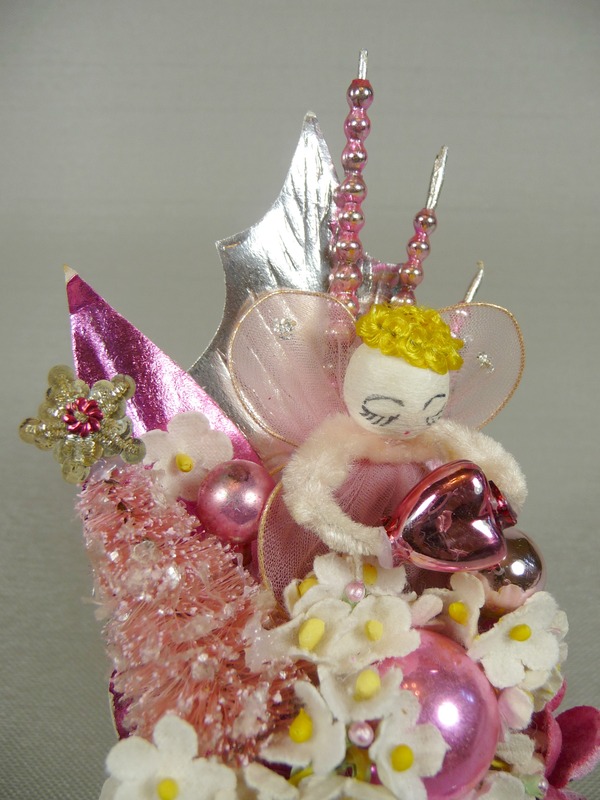 This is called my Pink Christmas in my Heart Corsage – and she holds a little pink mercury glass heart in her hands. Notice all the pink glass – there’s even a pink bottle brush tree! Watch for these corsages and more to be listed before July in my Etsy shop – and sign up to my blog and be notified first for upcoming sales and discount codes. Let me know if you have a special vision for a corsage – I’ll see if I can put it together and post it here for you to see! Enjoy the barbecue! I’m off to find some vintage Santas! 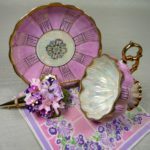 Thinking about that tea cup gift set with a matching corsage and vintage hankie? 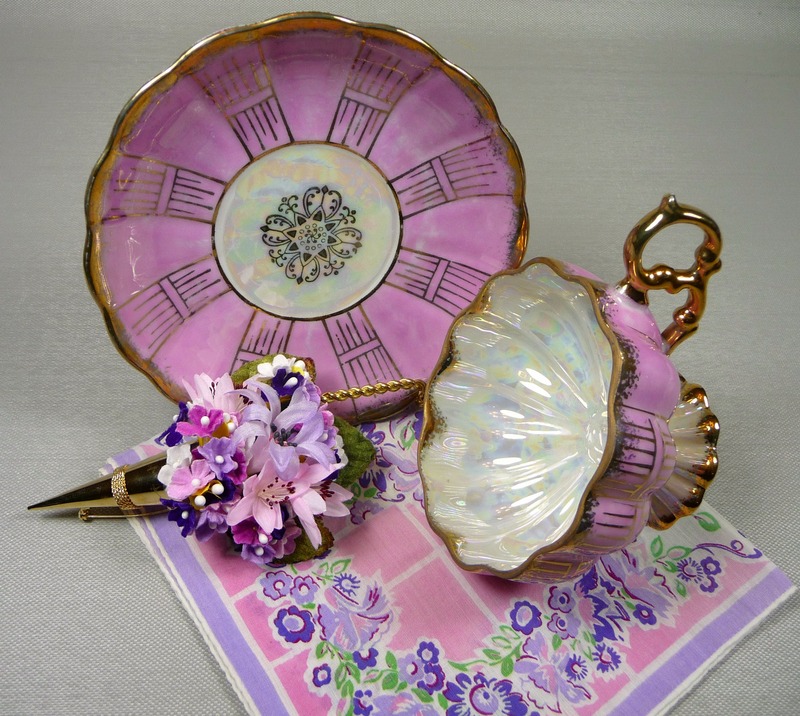 Check out the shop now – all sets are on sale $5.00 off through Mother’s Day! There are still a number of beautiful tea cup and demitasse cup selections, so stop by now and pick up a one of a kind gift for Mom now! Use coupon code BLOG10 and get an ADDITIONAL 10% off! What are you waiting for? !